Senate Majority Leader Mitch McConnell Addison (Mitch) Mitchell McConnellFormer Bush assistant: Mueller report makes Obama look 'just plain bad' 20 years after Columbine, Dems bullish on gun reform Dem says marijuana banking bill will get House vote this spring MORE (R-Ky.) on Friday said that Brett Kavanaugh will be on the Supreme Court "in the very near future" even as President Trump Donald John TrumpImpeachment? Not so fast without missing element of criminal intent Feds say marijuana ties could prevent immigrants from getting US citizenship Trump approval drops to 2019 low after Mueller report's release: poll MORE's nominee faces a sexual assault allegation. "You've watched the fight, you've watched the tactics, but here's what I want to tell you: In the very near future Judge Kavanaugh will be on the United States Supreme Court," McConnell said while speaking at the Values Voter Summit in Washington, D.C. He added that Trump has "nominated a stunningly successful individual" and told conservatives not to get "rattled" because Senate Republicans are going to "plow right through it." McConnell's comments come as a sexual assault allegation has thrown the timeline for a potential vote on Kavanaugh's nomination into limbo. Republicans hold a narrow 51-49 majority in the Senate. They can only lose one GOP senator before they would need to lean on Democrats for help getting Kavanaugh confirmed. Several Senate Republicans remain on the fence, but McConnell's comments indicate that he remains confident that Kavanaugh will get the 50 votes needed to be confirmed. Republicans had wanted to get Kavanaugh confirmed by the end of the month, but that timeline has slipped after Christine Blasey Ford publicly accused Kavanaugh of pinning her to a bed and attempting to forcibly remove her clothes at a party in the early 1980s. McConnell's speech came as a 10 a.m. Friday deadline set by Senate Judiciary Committee Chairman Chuck Grassley Charles (Chuck) Ernest GrassleyOn The Money: Inside the Mueller report | Cain undeterred in push for Fed seat | Analysis finds modest boost to economy from new NAFTA | White House says deal will give auto sector B boost The 7 most interesting nuggets from the Mueller report Government report says new NAFTA would have minimal impact on economy MORE (R-Iowa) for Ford to let the panel know if she would testify at a Monday hearing came and went without an announcement. 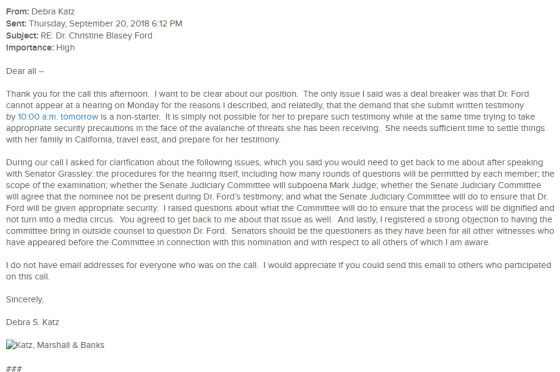 Ford's lawyer told Judiciary Committee staff in an email Thursday that the Monday hearing and the Friday morning deadline for a prepared copy of her testimony was a "non-starter." Ford's lawyer had similarly shot down the Monday hearing during an email sent Thursday, while leaving the door open to a hearing later in the week. “She wishes to testify, provided that we can agree on terms that are fair and which ensure her safety,” Debra Katz wrote asking to talk with Judiciary Committee staff about the “conditions” for such testimony.